VIPAccessEXCLUSIVE: ‘Twas A Mother’s Day Well Spent At The Los Angeles Times’ “Pizza Fest… A Tutti Pizza” LA Food Bowl Event — Recap Here! You know what they say, “Problems come and go, but pizza is forever.” Pizza is, hands down, one of everyone’s favorite food to munch on. It’s like the best-friend you can always turn to and you know it will always make you feel oh, so good inside. So, what if we told you that you could have spent an entire day eating pizza and taste-testing some of the most delicious pies from beloved pizzerias around Los Angeles?! We know, your mouth is probably watering already. Well, it surely was a Mother’s Day well spent as the Los Angeles Times hosted its “Pizza Fest… A Tutti Pizza” event as part of its highly-acclaimed, renowned LA Food Bowl where attendees were in pizza heaven as they were able to try various pieces of scrumptious, artisanal pizzas. The remarkable event took place on a sunny and marvelous Mother’s Day on May 13, 2018 at the Hollywood Palladium in Los Angeles, California. Incredible vendors at the event included Urban Oven, Urban Pie, Prova Pizza, Verace Pizza Napoletana, Ambrogio15, DeSano, Il Romanista, OliveWood Pizza, Prime Pizza and the Good Pizza. Are you craving for a traditional, pepperoni pizza topped with tons and tons of cheese? Or what about a good ‘ol grandma pizza pie? Are you dreaming of a magnificent pizza pie with capers and anchovies? Well, all of those choices… and a whole lot more were at the LA Food Bowl’s Pizza Fest. Needless to say, attendees had their mouths full with some of the most decadent and outstanding pizza slices on this planet. Not only was the phenomenal event filled with an endless amount of opportunities to try a variety of different kinds of pizza pies, but guests were also able to enjoy fantastic, cooking workshops hosted by Authentic Italian Table, food talks, craft beer and music. Special guests at the event also included Daniele Uditi (Pizzana), Nancy Silverton (Mozza), Tony Gemignani (12 time world pizza champion), Phil Rosenthal (producer, “Somebody Feed Phil,” Netflix), Enzo Coccia (Pizzaria La Notizia in Naples, Italy), Zach Pollack (Cosa Buona) and Colman Andrews (The Daily Mean). In addition, Los Angeles Times restaurant critic Jonathan Gold and Los Angeles Times Deputy Food Editor Jenn Harris were also at the event to join in on all of the fun. I, Alexisjoyvipaccess had an exceptional time covering the LA Food Bowl’s Pizza Fest. This brilliant event was like having Italy at your fingertips. Who wouldn’t want to spend a day indulging in some of the greatest pizza pies that Los Angeles has to offer?! Once again, the Los Angeles Times brought extra excitement to all food lovers with this stellar event. The LA Food Bowl has made May an unforgettable month full of food-inspired surprises at every turn. 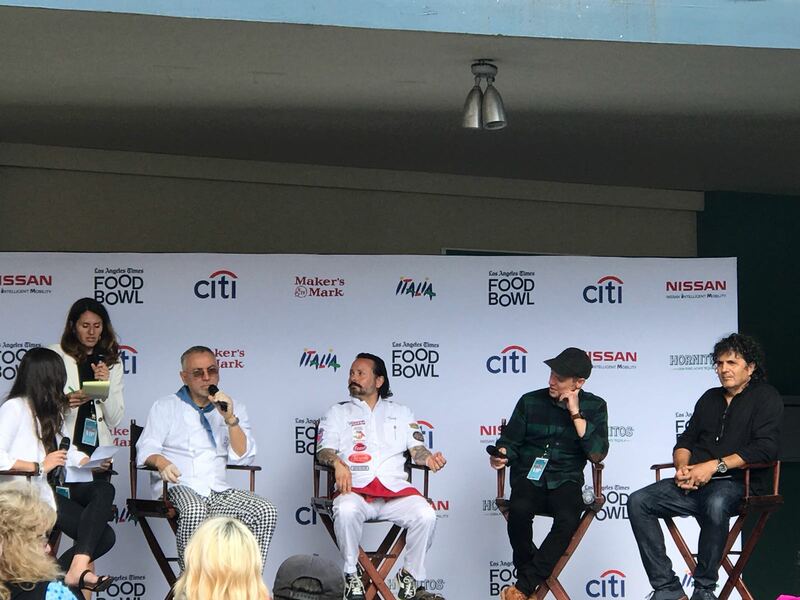 The LA Food Bowl promises even more sensational events that food lovers can look forward to throughout the rest of May. Be sure to stay connected with the LA Food Bowl by following @LAFoodBowl on Twitter and Instagram and join in on the conversation by using #LAFoodBowl on all social media networks! Previous Article: Pay Homage To The Iconic Marilyn Monroe At The Rockwell Table & Stage’s One-Night Only Production Of “With Love, Marilyn” — Check Out A Q&A With The Star Of The Show, Erin Sullivan Here! Next VIPAccessEXCLUSIVE: As If! The Rockwell Table & Stage’s “UMPO: Clueless” Show Is Absolutely Hilarious And Is Calling Your Name – Get Your Tickets Now — REVIEW Here!